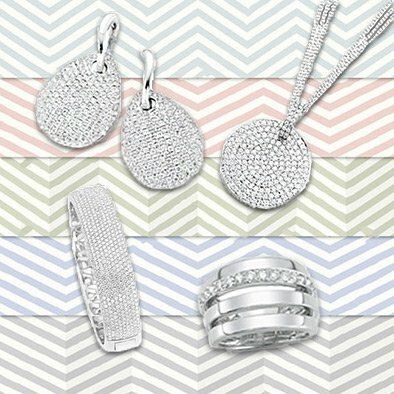 PAVE & MICRO-PAVE: Is a setting style that refers to diamonds set closely together, held in by tiny beads or prongs. This is a low profile technique that lays close to the hand and minimizes the appearance of any metal. “Micropave” shanks measure around 1.70-1.80 mm thick; these diamonds are set under a microscope so hence the term “micro”. MULTI-ROW PAVE: This is the same setting technique as pave, but instead of a single line set, it may have double,triple or even six rows of micro pave diamonds on a band. A three- row micro pave band, which is the most common, measures starting at 2.30 mm wideand can go as thick as 5.00 mm. 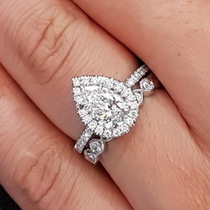 SHARED PRONG BASKET: Prongs along with a metal bar hold the diamond into place and while there is more metal on the profile, it does allow for thinner prongs on top and a more structured appearance. Generally, we use the basket design for a larger diamond eternity band, but can also be made for smaller diamonds sizes, such as 2.50 mm wide. 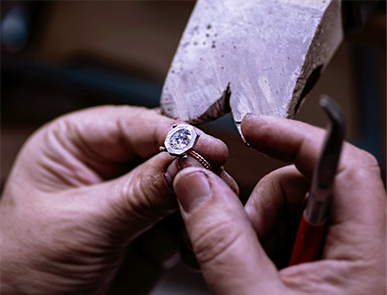 BEZEL: This type of setting encases the diamond with a thin rim of metal. Primarily known for its clean appearance and sturdiness, this setting style usually incorporates milgrain etching as well to give it a vintage feel. Our round bezel bands start at 1.75 mm wide and goes up to 3.50 mm+. BRIGHT-CUT: Bright-cut is actually a type of pave setting whereby the diamonds are set with tiny walls surrounded the metal to give the surface a highly reflective, sparkling appearance. CHANNEL: A channel setting refers to a type of stone setting where the stones are fitted into channel walls and held into place on each side by a continuous strip of metal. This is a classic look that does add more metal and bulk to the look of the band. These are engagement rings with pave diamonds surrounding the center-stone (referred to as a halo) and shanks that measure 1.7mm wide. The MM measurements shown below corresponds to the width of the diamond wedding band shown in each photo. These engagement rings have a bolder look and feature pave shanks ranging in width from 2.2mm to 2.55mm. Most clients would look to pair this with a matching, or thicker, wedding band in a variety of setting styles. Below are some examples; the first millimeter measurement relates to the engagement ring shank, with the second measurement referencing the wedding band width. Rose gold is a more subdued metal color that blends in well, with most people's skin tone. Yellow gold, because of its bright sunshine color, will stand out on most people's skin tone. The beauty about either of these metal colors, is that they can also pair beautifully with a contrasting white gold or platinum wedding band. The MM measurements below reference the width of the wedding band shown in each photo. These designs have three rows of pave diamonds going down the shank, with the most distinguishing factor between each engagement ring being a rounded/domed appearance verse a more squared off look. The first model number and MM measurement refer to the engagement ring shown, while the second MM measurement relates to the wedding band itself. 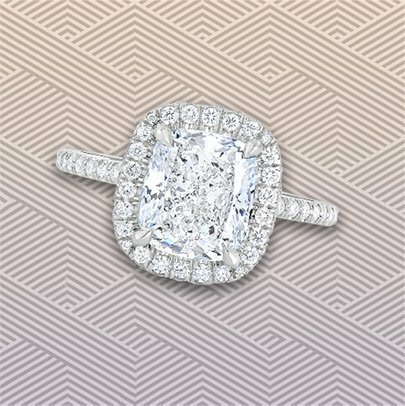 The most classic of engagement ring styles was once difficult to pair with a wedding band. We have changed that at Lauren B, as many of our handmade three-stone ring designs allow the option of a perfectly flush fit band to go with it. Below, the first MM measurements is the thickness of the engagement ring shank, and second measurement is for the wedding band itself. These elegant engagement ring styles feature plain bands with no diamond accents on them. Solitaire rings offer great versatility and pair beautifully with a wide range of wedding band styles.